Precious Crawley has been a canvasser for two months. Photo courtesy of Fight for $15. 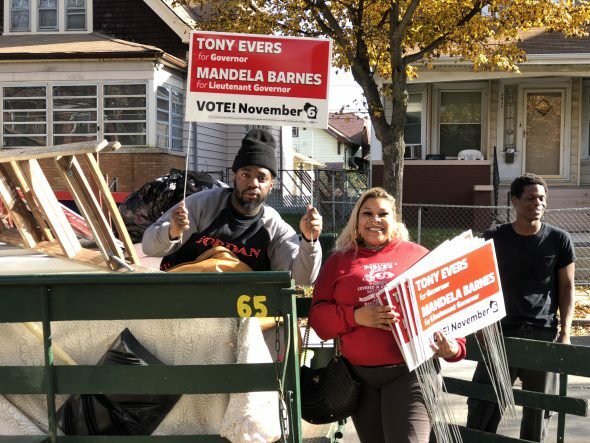 Precious Crawley tells two young boys this as she hands them yard signs that read “Tony Evers” and “Mandela Barnes.” The boys excitedly promise to bring the signs home to their parents and run off as Crawley continues making her way through the neighborhood, striking up conversations with strangers as she goes. Crawley is a Fight for $15 Canvasser – someone who is deployed into a neighborhood to open up discussions with residents on upcoming elections. Crawley works for Milwaukee Area Service and Hospitality Workers Organization, a nonprofit union organization that helped establish the agreement with the Fiserv Forum that has solidified a $15 an hour wage floor for employees as well as union rights. Fight for $15 continues to push its campaign in hopes of bringing the $15 wage floor, union rights and affordable health care to all people statewide. The organization believes that one of the most important steps in doing so is removing Gov. Scott Walker from office. Precious Crawley poses with a neighborhood resident who promises to vote. Photo courtesy of Fight for $15. On Nov. 3, Crawley and fellow Fight for $15 Canvasser Briana Gee set out in the North Division neighborhood to remind residents to vote and to convince them to place a Tony Evers/Mandela Barns sign in their yards. The area had previously been covered by canvassers getting residents to sign voting pledge cards. On Nov. 6, the canvassers will sweep the area once more with a final reminder to vote. Crawley and Gee share a similar story – they’re both young mothers in their early twenties. They both struggle to make ends meet. Crawley works two jobs outside of her role as a canvasser: She works at McDonald’s and Family Dollar. Both jobs bring in less than $8 an hour. Gee works as a security guard at Allied Universal Security. She’s put that job on hold to canvass, but will return once the midterm election ends. Their busy schedules leave them little time to spend with their children, but canvassing has proven to be an important part of each of their lives – not just a paycheck. Gee has been canvassing for one month, and Crawley for two. Gee is a first-time voter this year. 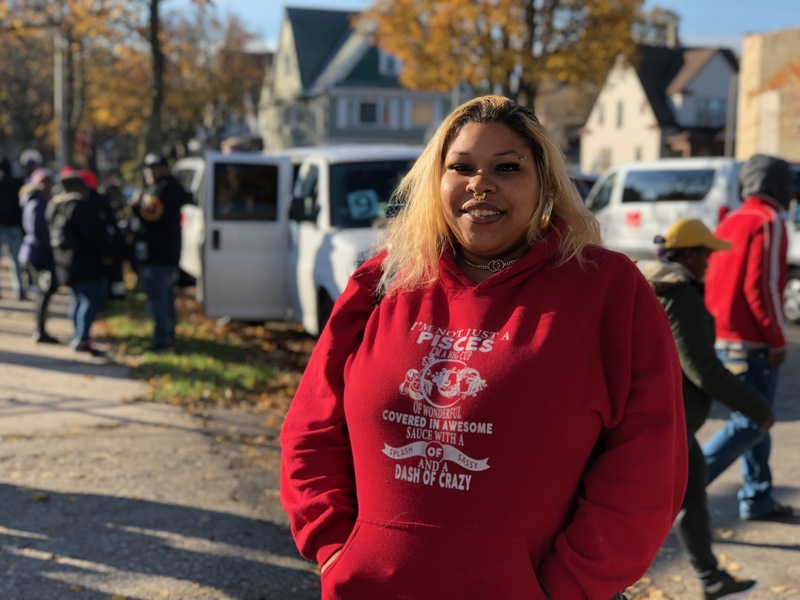 Her involvement with Fight for $15 as a canvasser ignited within her an interest in politics – something she had mostly ignored in the past. She’s hoping to ignite a similar spark in others who ignore elections. Together, the two canvassers work their way through their scheduled blocks house by house. Crawley takes the houses on one side, and Gee works the opposite side. Their approaches are unique to their personalities, and are only loosely based upon a script drafted by MASH. Crawley’s charisma becomes her most useful tool as she combines flattery with a can-do attitude. This time, a smile appears on everyone’s faces, and they all greet her back. “Walker took our unions, and I’ll support any candidate who will raise the minimum wage to $15 an hour and give us the right to unionize,” Crawley explains to the family. After a short conversation, the family gives Crawley the green light to put a sign into their yard. For the next few blocks, every person that she interacts with ends up taking a sign. One elderly woman, who answer the door with her four grandchildren, asks how she too can become involved as a canvasser. As fun and lighthearted as some of the conversations become, the canvassers also remain professional. At one point, two men repairing a roof begin to heckle Gee as she is giving her pitch to a young woman outside of her home. The men yell things like “That’s the wrong sign!” and “You better hope those are sturdy!” Gee ignores the men and succeeds in convincing the woman to put a sign in her yard. Gee notes that she doesn’t often get heckled like that, but some people do become upset when strangers come knocking. But the first two hours of Crawley’s and Gee’s efforts are successful. Crawley returns with just two of the approximately 30 signs she started with. Aside from just putting signs up, the team also provided one man with information on how to get his Wisconsin ID to vote and informed neighborhood residents of the nearest polling places. Several residents also admit that they are more likely to vote after speaking with Crawley and Gee. One young woman in particular noted that she was leaning towards voting, but only because her father was encouraging it. After speaking with Crawley, she appeared to be sold. “You just motivated me a little more today, thank you,” she says to Crawley. It’s responses like this that has turned canvassing into more than just a job for Crawley and Gee. It’s become a part of a story that they’re trying to change for the better of their families as well as their neighbors.